On April 8, 1665, around 2 p.m., fishermen anchored near Barhöfft (then in Sweden, now in Germany) reported seeing ships in the sky battling each other. After the battle, a dark object hovered in the sky. “After a while out of the sky came a flat round form, like a plate, looking like the big hat of a man… Its color was that of the darkening moon, and it hovered right over the Church of St. Nicolai. There it remained stationary until the evening. The fishermen, worried to death, didn’t want to look further at the spectacle and buried their faces in their hands. On the following days, they fell sick with trembling all over and pain in head and limbs. Many scholarly people thought a lot about that,” wrote Erasmus Francisci in “Der wunder-reiche Ueberzug unserer Nider-Welt/Oder Erd-umgebende” in 1689. Francisci had gathered news reports from 1665 related to the event. The “scholarly people” who considered the event and the illness could not discern the causes. In the June 2015 edition of EdgeScience magazine , Chris Aubeck and Martin Shough detail their investigation of the event. Aubeck is the founder of the historical research group Magonia Exchange, an international archival project, and a prolific writer on the subject of UFOs as cultural history. Shough is a research associate for the National Aviation Reporting Center on Anomalous Phenomena (NARCAP). Aubeck and Shough looked at various possible explanations for the phenomenon. They ruled out certain celestial phenomena. The angle of the sun described in accounts would preclude an ice halo, for example. Could It Have Been a Mirage? A Fata Morgana is a kind of mirage that appears just above the horizon when the right mix of thermal layers is present in the air. The mirage shifts frequently and can sometimes make it look like there are ships in the sky just above the horizon. The 1665 event was described as occurring higher in the sky than a Fata Morgana would appear. A mirage also would not explain the plate- or hat-shaped object that was said to remain into the evening, as Fata Morgana do not remain stable for so long. Could It Have Been a Flock of Birds? An unusually large flock of starlings may have resembled such a scene, Aubeck and Shough said. Flocks sometimes merge together in startlingly well-defined masses that move in patterns before settling down. Perhaps in the spring of 1665 more starlings than usual were pushed by uncommon weather to move west of the Baltic to their summer breeding grounds? A flock would still not account for the dark object that stayed in the sky until night-fall. Is it possible two unusual phenomena occurred at once, one producing the scene of the battle and another producing the mysterious, hovering object in the sky? Featured image: Right: A 1680 engraving accompanying a description by Erasmus Francisci of a battle between ships in the sky said to take place in 1665. 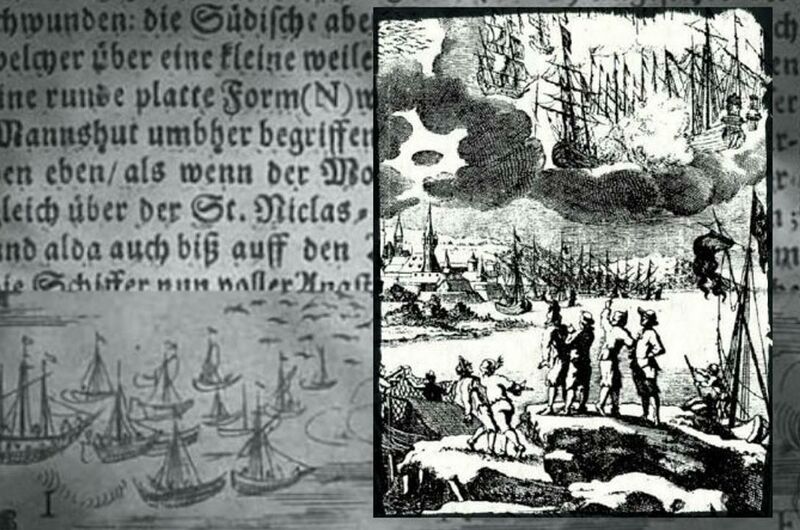 Background: Text and an image from “An Illustrated Description of the Miraculous Stralsund Air-wars and Ship-battles), 1665.